I was stropping around on the promenade in Minehead (Somerset) aggrieved because sea-side fish and chips should be the best - crispy batter, tasty fish - and mine wasn't (soggy, under-cooked, thick and stodgy batter, tasteless and distasteful fish) when I decided to sit on a bench where I could look at the wall which obscured the sea. No-one was smiling much. I'd come up from the beach where a young man had been looking at his phone while he explained to a bored toddler in his charge that children are supposed to enjoy playing with the sand because that's what little children should do and that said little child shouldn't start climbing the steps back to the promenade in an endeavour to escape all this boredom . . . and went to sit on this bench. For a sea-shaped bench it was surprisingly comfortable. I didn't mind sitting on wooden waves - especially when I noticed they were harbouring a veritable garden of little plants. The light was failing so pictures of the plants were mostly blurred - and I had to hurry because other people wanted to sit on the bench too and were looking on bemused because I'd got off it and was pointing my camera into it. But if the sun had been shining and I had had more time - you too would have been wowed by the variety there. Street plants are everywhere. We even sit on them! 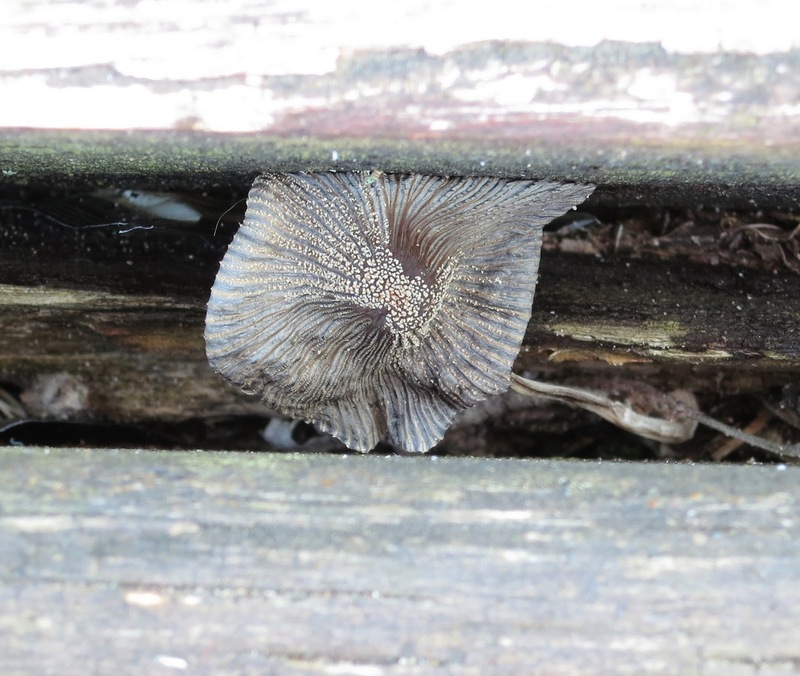 Here's a toadstool growing between the slats of the same bench. And another time this summer . . . while walking down a street beside the Oxford University Press (in Oxford) in the dark (I walk in sunshine some times) I saw this plant perched right up on the roof. 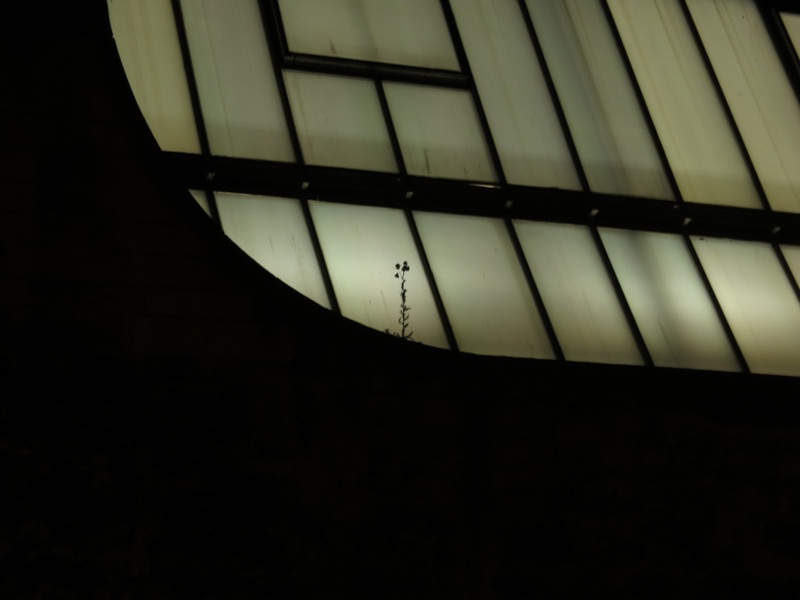 If it hadn't been dark, if the lights inside hadn't been on, if the roof hadn't been made of glass - I doubt I would even have noticed it. But there it was. Lonely but proud. 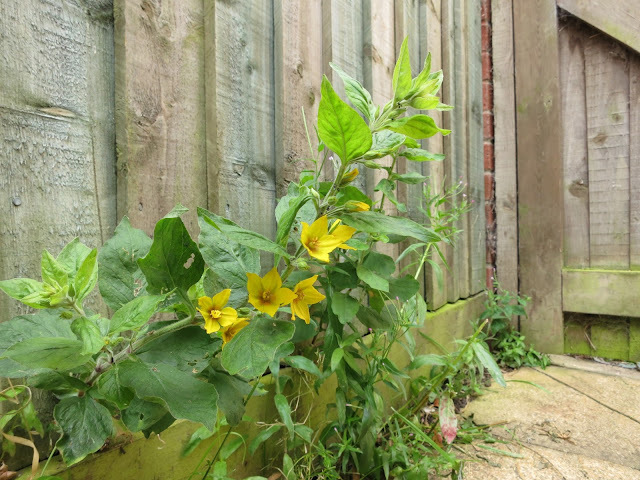 And to prove I do sometimes come out in proper daylight - here's a Dotted Loosestrife that invited itself to live beside someone's garden gate. A garden isn't a street - but this is a plant that had wandered in from the street so I reckon it counts. And this isn't a street plant post - in the sense that on the 21st of alternate months I invite you to search for wild plants in the roads where you live - up on roofs, pressed against fences, lurking in curbs and hanging out on walls. But once I'd seen these I didn't want to lose track of them so I've posted them now. 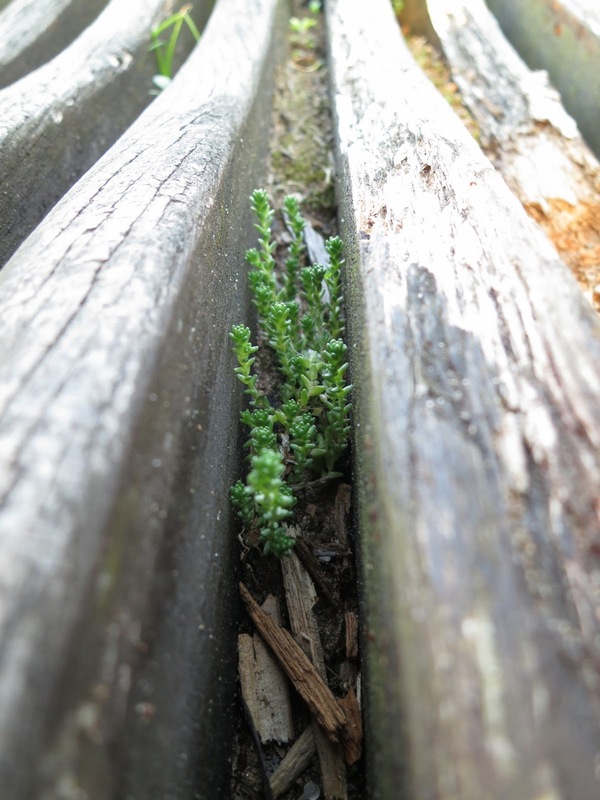 The next Street Plant Post with a Link Box will be on 21st of October. on 21st of this month - September 2015. Over the next weeks my summer hectic-ness will be winding to an end and I'll be keeping up properly with posts so they coincide with their boxes. It's been a daft time. Thank you all for bearing with me! ID with advice (as usual!) from iSpot. A great post Lucy. I love the idea of posting street plants, I've seen quite a few over the past few days. I will have to take more photos (I've taken some) and try to remember to share them on the 21st. You noticed a weed way up yonder in the dark? Well spotted (and photographed)! By the way, I missed the tree-following link (bad me!) Will write and post it anyway..
Love everything about the bench - thanks! Hello Leafencounter. The evening was dulling down but had not yet reached dark. However, between the slats of the bench it was pretty murky. I took quite a few pictures - there were loads of little plants and quite a variety of them - but they came out blurred. I was glad at least to get these in focus. Hello Colleen. 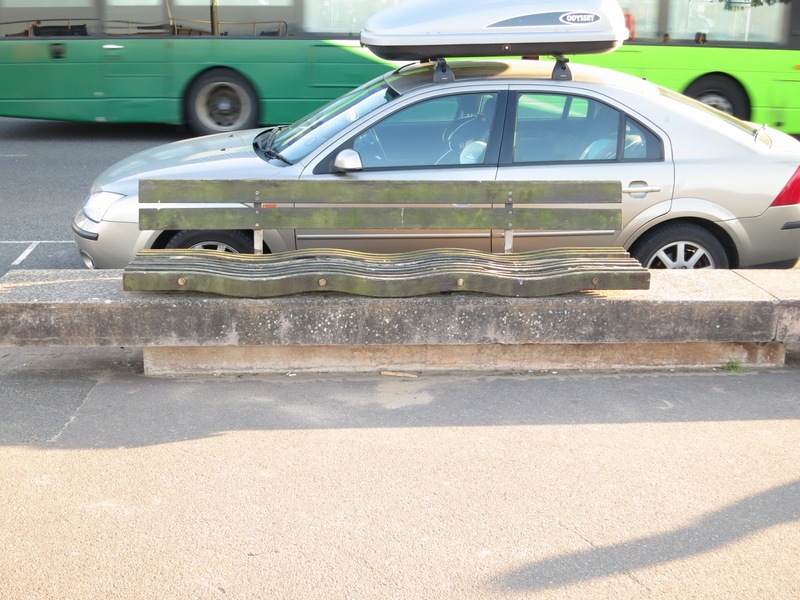 There aren't benches like this where I live but whenever I come across ones like it from now on - I'll be peering in! I really like the wave bench and the plant life that it's sheltering.